OMER NADEEM is getting success each and every day is now he is a big hit. 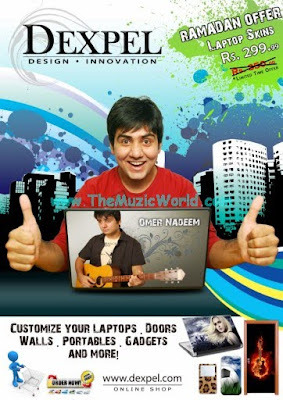 The proof of his popularity is that DEXPEL selected OMER NADEEM as the brand ambassador. Dexpel is a consumer targeted company that manufactures and sells it products directly to its customers. All products are manufactured after receiving orders from the customers to ensure 100% satisfaction & customizability for the consumer. Dexpel are makers of designer skins for Laptops, iPhones, PSPs, Doors, Walls, Portables etc. Dexpel custom trims customers selected design to fit on their device, door or any surface they like. Dexpel is the first of its kind in Pakistan. They are happy to launch in PAKISTAN and expect to get an overwhelming response from their customers. Omer Nadeem has been signed as the face that will represent dexpel in magazine ads, billboards, e-adverts, TV ads etc.